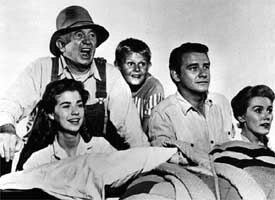 The Real McCoys was a televised situation comedy that ran from 1957 to 1963. One of the first sitcoms of its kind, The Real McCoys chronicles the trials and tribulations of a West Virginia mountain family who inherit a California ranch. They become both the givers and receivers of classic culture shock in this warm hearted comedy. 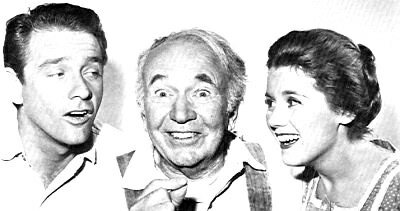 The McCoy family patriarch, Grandpa Amos McCoy, was played by talented and well known character actor, Walter Brennan. Brennan plays Grandpa as a nuanced character, with a subtle blend of brash country stubborness and grudging tenderness. Accompanying Grandpa on this cross country migration is grandson Luke, played by Richard Crenna. Luke's new wife Kate (Kathleen Nolan) and his siblings, Hassee (Lydia Reed) and Little Luke (Michael Winkleman) round out the charming country clan. All of the McCoys adapt to their new environment in unique ways, causing conflict among themselves and their new neighbors, to great comic effect. After this show blazed a trail, many other rurally-themed comedies sprung up in its wake. It could almost be said that The Real McCoys spawned its own genre. In this collection are episodes which were expertly adapted for radio audiences. See also: Granby's Green Acres. Be the first to comment on "Real McCoys"